One of the issues that I had early on was with perspective. I struggled to draw things that “looked right”. And in my early attempts at comic book art, I tried drawing very complicated scenes that required a little more than what my limited knowledge on basic perspective could offer. Most art books back at that time offered the bare-bones basics of perspective. With that basic information, as long as I kept things simple, I was okay. Otherwise, I had to do what a lot of green artists do, fake it. As long as it looked alright it didn’t matter. Heck, I caught other artists from different comic strips and mainstreams comic books pulling it off. That’s how I justified my ignorance. David Chelsea is himself a commercial artist who makes his money from clients such as the New York Times, The New York Observer, and The Wall Street Journal. He made a name for himself in the comic book world with his graphic novels, “David Chelsea In Love” and “Welcome To The Zone”. Chelsea is also the creator of ten 24-hour comic books. He also has the habit of making appearances at comic cons around the United States. Perspective! For Comic Book Artists is a book that was purposely tailored to comic book artists and illustrators. These are people who are often tied to their desk and have to work from their imaginations. In that spirit, the format of the book is that of a graphic novel, or a thick comic book. That’s pretty nice because in my experience, it’s much easier to read from a comic book than a book with lots of text that allow for the mind to wander off. Within the book, Chelsea works to keep the reader’s attention by spinning a simple narrative, which carries the reader from topic to topic. Here’s a rough synopsis: The author, as himself, gets a call from his frustrated friend Mugg. (Who’s head is literally a mug.) Mugg’s a hot-shot newbie penciler that’s having issues drawing backgrounds. Chelsea goes to visit his friend and takes him on a guided educational tour of perspective drawing. It’s reminiscent of the old Walt Disney animated educational films that I’ve seen while in elementary school such as “Donald in Math Magic Land“. In each chapter, the author presents Mugg and the reader with a new topic. Then he breaks it down in an easy to understand manner. He uses generous amounts of visuals for the reader to experience and study. Chelsea makes full use of the graphic novel format. A perfect example is Chelsea’s explanation of convergence. Chelsea tells Mugg to look through a telescope to see Mr. Distance Man, as portrayed by the author, holding one hand out in front of his face, while the other is stretched out behind him. Unlike when the author strikes the same pose in front of Mugg, Mr. Distance Man’s hands look to be the same size. If you’ve had any experience with perspective, you’ll know that the further away something is, the smaller it should look. So why the heck are Mr. Distance Man’s hands the exact same size? Had Chelsea drawn them incorrectly? To explain this circumstance, the author uses the analogy of having money. The more you have, the less having more matters. If a billionaire goes to pick up a five (U.S.) dollar bill, it would only add 0.0000005% to his wealth. Unless he’s Scrooge McDuck or the author of this review, the billionaire is more likely to be indifferent towards the five dollars. By contrast, a homeless man would instantly scoop up a five dollar bill. Adding five dollars would increase the homeless man’s wealth by 1,000%. When you see Chelsea from 3 feet away, stretching one hand in front of his face while holding his other hand outstretched behind his head, his furthest hand is approximately 9 feet away from your eye or 300% farther away. By contrast, when Mr. Distance Man strikes the exact same pose, his nearest hand is about 3 miles away. His furthest hand would be an increase of 0.0001%. Such a tiny increase would visually make little difference to your eye. As the reader progresses through the book, Chelsea goes deeper into the more technical details. If you thought geometry was a headache, the chapters covering one-point perspective on up will give you a migraine. You will be using graphs, protectors, a compass, and possibly a t-square. As you’re working on your cubes and whatnot, it will feel rather tedious and time-consuming. This could lead to some frustration for those that lack the patience. Just keep in mind that Chelsea is simply pushing the reader towards achieving more accuracy in their perspective drawing. Accuracy takes time. If you’re unable to “fake it ’till you make it”, it honestly wouldn’t hurt to follow Chelsea’s methods. From my experience, they work really well until your drawing becomes more complicated and there are a ton of lines everywhere. If you’re drawing a background for a comic book, you’ll benefit from a pad of tracing paper. Use the tracing paper to work out your perspective. Then transfer the drawing to your page. Digitally, you can use separate layers in PhotoShop, Painter, Gimp, or Krita to achieve the same results. The two chapters that impressed me the most were the ones that cover drawing circles in perspective and the human body. These are two subjects that are usually briefly covered in most how-to-draw books. I honestly learned the most from Chelsea’s chapter on drawing circles in perspective. This chapter is exhaustive in its detail. It covers ellipses, spheres, parabolas, and hyperbolas. He demonstrates how ellipses become distorted in perspective by the cone of vision. Chelsea also dispels some common myths. For example, the center of the ellipse isn’t always the perspective center of the ellipse. Another example is that a sphere in perspective isn’t always a perfect circle. The author, of course teaches Mugg and readers how to properly draw circles, ellipses, and other curved shapes in correct perspective. He even provides shortcuts for drawing multiple ellipses and gives tricks for drawing them in both two and three point perspective. In “Perspective! For Comic Book Artists”, the story takes a bizarre turn when Chelsea and Mugg visit a nudist colony that doesn’t allow you to even wear your skin. During the visit, Chelsea goes through the many stumbling blocks that artists struggle with while drawing the body in perspective. He also provides a few solutions and useful hacks that help artists draw various parts of the body. Yes, Chelsea does provide readers with a few shortcuts for drawing in both two and three point perspective. 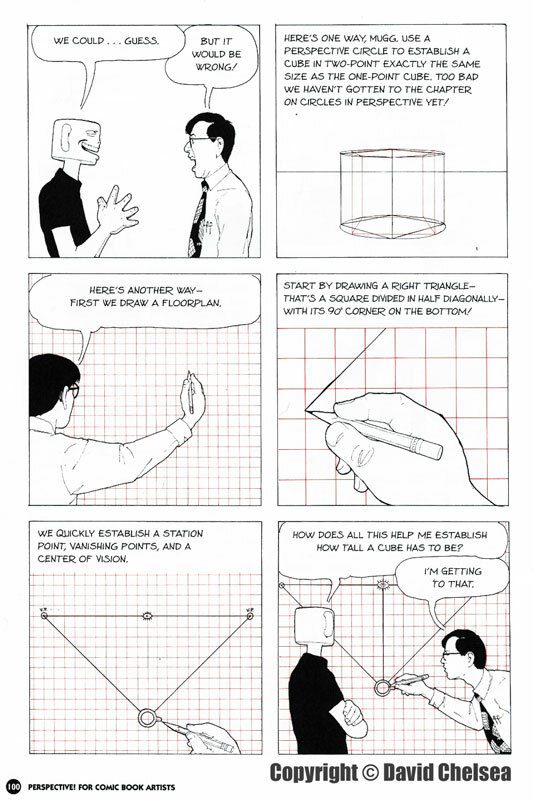 He also demonstrates how to use perspective graph paper for your perspective drawings. But you can always use the multiple perspective grids that the author provides in the back of the book. This book is great for anyone just starting out. This book will teach you perspective from the ground up. This book is great for anyone who needs to polish their drawing skills. It’s an easy read due to its graphic novel format and won’t cause your eyes to glaze over. If you need lots of clear visual examples, Chelsea provides them in ample amounts. This book covers topics that are normally just briefly covered in other books. I’ve owned this book for years and still use it as my reference to this day. “Perspective! For Comic Book Artists” will improve anyone’s drawing. You will easily learn a lot in a short period of time.